Not surprising, my card for 2011 is Temperance. With the book coming out, I will, indeed, have to deal with connections. This is a word that came up in my meditations, and has now been made even more clear to me. I think this is an excellent card for you to have this year, Quinn… much for the reason you give. This is a year of RE – restoring, rejuvenating, redistributing, reviving. And in the process of doing that, you will find new REsources that you can tap into… both within yourself and from others. Hmmm…does look to be a year of change for you, Fyre. Will be interesting to see what kind of transformations do take place for you this year! Hey! or should I say Howl? My card was 10, The wheel of Fortune. Not sure what to think of this one. hmmm…..
My husband and I both have The Chariot for 2011. This is fascinating and really a great card for us. For some reason, The Chariot as a Year Card makes me think of the chariot race from Ben-Hur. The whole story-line of that race… the planning involved, the practice, the changing to horses around to utilize each of their individual strengths while at the same time teaching them to function as a team. The reasons for participating in the race, the race itself, the results. This can be an analogy for how one can look at their Chariot Year. What race (project, goal, etc.) are you preparing for this year? What strengths can you bring to accomplishing it? What changes need to be made in order to achieve the goal? Why do you wish to accomplish it, and what would you gain by doing so?And since both your husband and you are in your Chariot Year, how can you function as a team to in order to make it to the finish line? This might be one way of looking at your Year Card, and the lessons it has to teach you. I agree with you. We both already know the “race” we are in this year and we are both, always team players. I am looking forward to this year and the rewards of it once we reach that finish line. Hmmm… interesting. My card is 5. The Hierophant, in the traditional Tarot. I’ve been working with Rachel Pollack’s The Shining Tribe Tarot lately. Card 5 in that deck is Tradition. Depicted on the card is a circle of 5 rocks which Pollack describes as “Spirits disguised as rocks to avoid the stares of humans… They meet to uphold the world and protect all their troubled children.” They are The Shining Tribe (secret beings, enlightened humans, Spirits who maintain the world, etc., any of the traditional “secret” beings), and as with the Hierophant, it is linked with religious teaches and traditions. “The Shining Tribe open paths for their children. These are pathways of life as well as of knowledge. The green pathways symbolize the physical world; the gold, the spiritual. In one direction the material world travels into the circle, where the Shining Tribe transform it into sacred energy. But the paths also go outward, that is, Spirit energy sent out into the ordinary world of our daily lives. That too is transformation. The idea of opening paths was particularly interesting to me as I continue my outdoor challenge (getting outside for a minimum of 30 minutes every day for a year — I’m on day 127). I have been physically walking paths — through the woods, around the pond, hiking trails nearby as well as in my travels — but I find it is changing me on other levels, being in such close contact with Mother Nature on a daily basis. My word for this year is Declutter, and I have taken that on in many ways. Physically, mentally, emotionally, and spiritually. It’s early in the year but I’m already experiencing an opening as I clear out the old and unnecessary, and a sense of lightness and freedom. It will be interesting to see how the word and the card work together throughout the year. 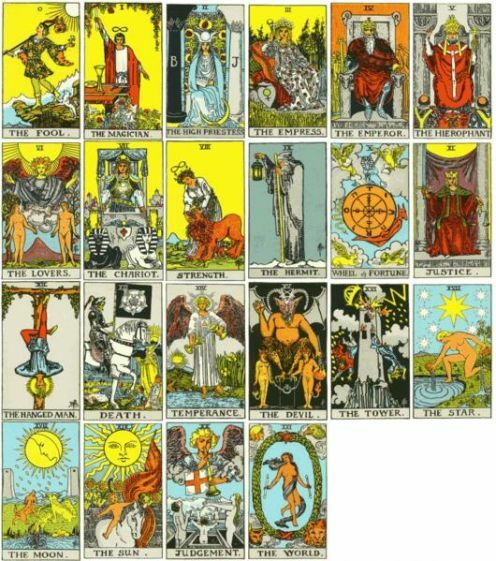 One thing that I really like about your comment is that you pointed out that different decks may have different interpretations for the Major Arcana. This is perfectly fine. If you have a special deck that you work with, then use that deck’s Major Arcana and apply it to your Year Card, and follow its interpretations. Don’t feel that you are bound to the order or interpretations that I have used here. I’m going with the traditional Rider-Waite order and meanings…but even my own favorite deck does not totally follow this order or interpretation. The important thing is…now that you know how to find your Year Card, you can apply the numerical system to any deck you wish. Whatever card matches your number, that’s the card to use. Once you discover your card, this opens up a whole world of possibilities as far as how you wish to interpret it and apply such interpretations to your life and to the lessons you need to learn. Only you know how best your Year Card applies to you and your situation. I do wish you all the best as you continue to open paths and establish new traditions. My card was 9, The Hermit. I find it interesting that this would be my card of the year. I’m at such a turning point with all my goals being achieved, I’m at a lost of what I want to do next- and am doing a lot of searching, as well as looking at different people and paths to listen and explore and add my own input. There are so many possibilities, I really have to look deep to find what my next choice will be. The sense that comes across to me is to see the Hermit as that guiding light to help you make choices regarding those possibilities. Don’t be afraid to ask for advice… but remember that part of receiving that advice is actually listening to it and acting upon it. As you’re looking deep and doing that searching – which is certainly good and healthy! – remember to reach out to those around you who can provide that wise counsel. I think it will be interesting to see how the year develops for you. Great to see the responses and sharing here. Since Osh used me as an example in the post, we all know I share with Fyre in the Death trump. 9+27+2011 is my card! That’s creepy! But I’m glad to know it means transformation… but not sure how to consider it in context since I’m always changing- I’m always moving, doing new things, etc. hmmm. Looks like there’s now two people I know both born on September 27th. I think that’s kinda cool! I think transformation – as defined by the Death card – goes a bit deeper than mere change. It’s a process…in which the journey itself becomes even more important than the destination. In fact, transformation is about that journey – the whole process of realization, recognition, releasing, reorganizing, rebirthing, rejuvenating, restoring, reviving, realigning, reestablishing. There’s a lot of RE involved with the process of transformation. Death does not occur alone… it occurs as part of the cycle of birth, death, and rebirth. This is the year to reassess where you are in that process. You’re right – we are constantly in a state of change. Nothing stays the same. But when the Death card comes into your life, it’s a reminder… a gentle tap on the shoulder to take a look at that whole cycle and at your own personal relationship with all those REs. I happened to stumble across this blog post while working on a Tarot-inspired background for my blog…I am so glad I did. Awesome blog post, and very informative. Turns out that my card for 2013 is The Hanged Man (how fitting, given the circumstances–having to let go of a lot of negative emotions). Out of curiosity, I also put in a little time with a calculator and noticed a pattern throughout the years of my life…the cards going in sequential order for ten years, then reverting back to a card closer to the beginning of the Major Arcana before repeating the pattern (sequential order until the next eleventh year before reverting back to a card closer to the beginning of the Major Arcana…but one card further along than the last revert). It almost seems as if every ten years we (in theory, at least!) move along one step farther along The Fool’s Journey to retrace those steps we haven’t quite learned from…or could learn more from. Hello Alex, and welcome to the Crossroads! Glad you enjoyed this post, and that you were able to gain something from it. I’m also happy that you did mention that pattern – you are right, there is a pattern that gets established, and you will have those sequential years for ten years until it reverts. I like how you phrased it as being that we move one step further along The Fool’s Journey…that’s a nice way of putting it, and I will have to remember that as I continue my own path! I’ve got Temperance this year, so it will be interesting to see how it works for me.